Here are some facts about Westminster Abbey. Westminster Abbey is a large Gothic style church, located in Westminster in Central London. It is across the street from the Houses of Parliament and close to Buckingham Palace. The current abbey was built between 1245 and 1272, under the direction of King Henry III. Some parts of an earlier building built in 1050 survive and can still be seen today. 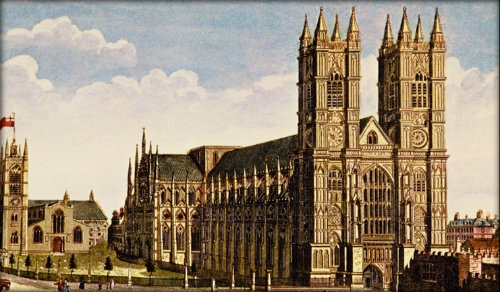 Edward the Confessor started the building of a royal burial church on the Westminster Abbey site. The building was completed in 1090 (after Edward’s death). Edward the Confessor and his wife, Edith, were buried in this church. King Harold II (probably) and William the Conqueror (definitely) were crowned there. The demolition of this building was ordered by Henry III to make way for the new abbey. Over 3,000 famous people have been buried in Westminster Abbey over the centuries. The tombs of Charles Dickens, David Livingstone and Charles Darwin can be seen here, as well as those of several British poets. Westminster Abbey’s College Garden is a peaceful spot and one of the oldest gardens in England. At one time it was used by the monks to grow medicinal herbs and food. Almost every British monarch has been crowned on the abbey’s famous Coronation Chair. The chair has graffiti from visitors to the abbey during the 18th and 19th centuries. The Chapel of Our Lady of the Pew is carved out of the wall and only has room for people to stand. The small space was dedicated to the Virgin Mary during the 14th century. The lifelike figures of many British kings and queens can be seen in the abbey’s museum. At one time these were displayed at funerals and displayed on tombs. Highlights of Westminster Abbey include the nave, which is the highest in England, and the chapel of Henry VII. The stained glass window here commemorates those lost in the Battle of Britain. Two schools are within the precincts of Westminster Abbey. The Westminster School was founded in the 11th century and famous pupils include Sir Christopher Wren (the architecht of many of London’s buildings, including St Paul’s Cathedral). Over a dozen royal weddings have taken place at Westminster Abbey over the centuries. In April 2011, the wedding of Prince William and Kate Middleton was held there. What next? Discover more facts about London by visiting our London resources page.